I’ve been meaning to visit The Clove Club ever since it opened its doors early this year. The only reason it has taken me this long to get round to it is the simple fact that I live down the road from their original sister restaurant Upstairs at the Ten Bells. And frankly, I didn’t think things could get any better than Upstairs which remains one of my favourite restaurants in the neighbourhood. But believe you me, the Clove Club is more than just another Shoreditch hipster hangout or an upmarket version of its less formal sister restaurant. Chef Isaac McHale & team are seriously pushing their brand of avant-garde and seasonal British cuisine to new heights here. The old Shoreditch Town Hall in which the Clove Club sits has been wonderfully restored. They’ve kept the deco throughout on the simple side, but the high ceilings and original features still ooze of old world Victorian charm. Our party of three parked at the lively bar area during our lunch visit, but there’s also the choice of sitting in their spacious main dining area with the hive of activity of their open plan kitchen in the background. It’s £35 for 3 courses including snacks for lunch. And I was particularly pleased to see what is arguably my favourite snack on the planet featuring on the list of nibbles – their gorgeous Buttermilk Fried Chicken (a staple item on the Upstairs menu as well). Crispy, super succulent and coated in their signature aromatic pine salt, it’s seriously the Rolls-Royce of chicken nuggets. Gamey wood pigeon sausages served with a sweet and tangy greengage ketchup were also a highlight, leaving us wanting more. In contrast to their no-choice 5 course tasting menu for dinner, you have 2 choices each of starters, mains and desserts at lunchtime. 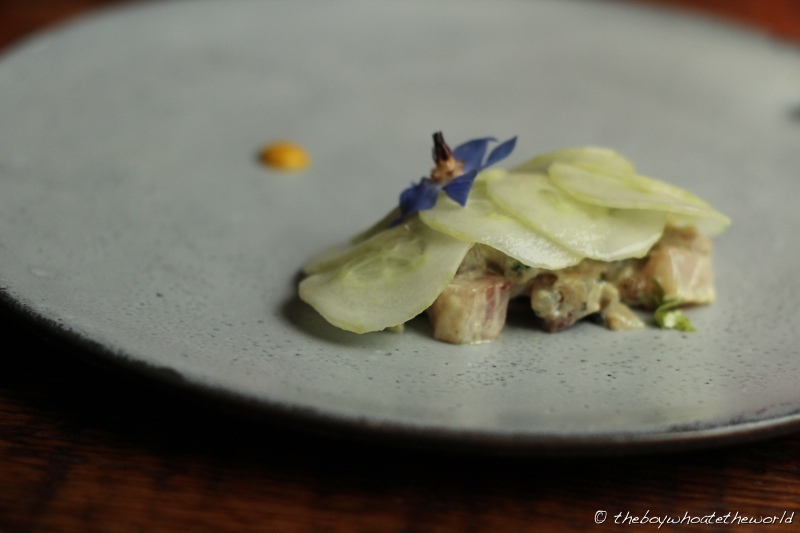 I started with their Mackerel tartare which was semi-concealed under a bed of cucumber slices and edible flowers. The portion was rather miniscule, but the smoky, flame-grilled flavour of the mackerel chunks went well with the tart gooseberries and creamy, remoulade-style dressing. My dining companions fared better in the portion department with the roast partridge. 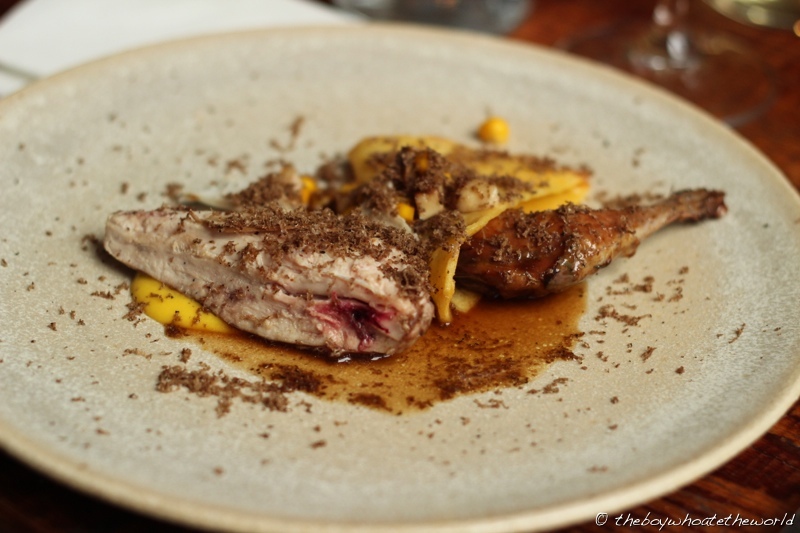 The meat was extremely moist and juicy whilst the earthiness of the cep shavings brought out the delicate gamey flavour of the partridge beautifully. The gorgeous plating and quality in the cooking continued into the main courses. Cornish Sole was slow-cooked to perfection. 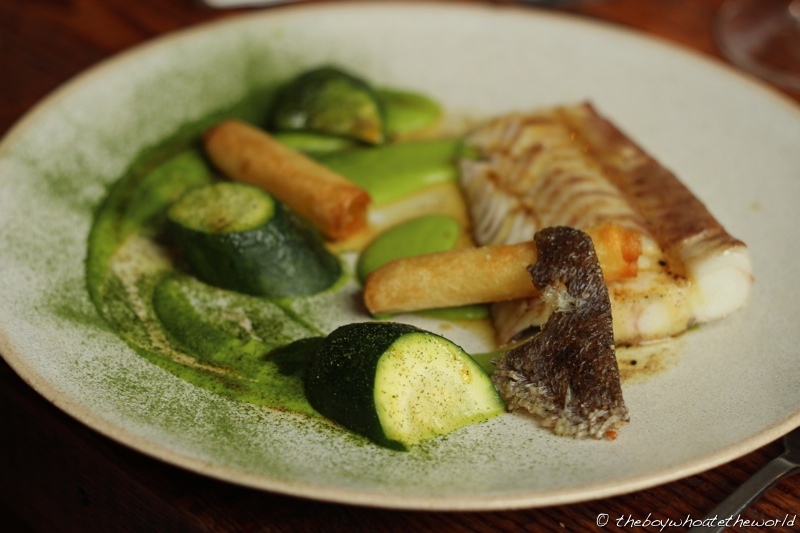 The moist, melt-in-the mouth fillet was delicately spiced and served with crispy skin, crunchy potatoes and several different textures of courgettes (whole, pureed and dehydrated). The interplay between the different components and textures was just outstanding. My Venison dish was also very well-executed. 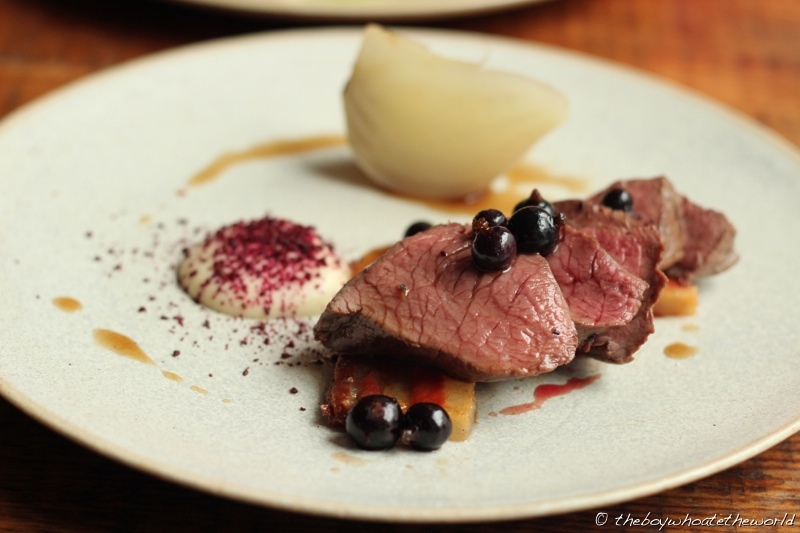 The loin was tender and cooked to a wonderful pink whilst the different forms of blackcurrant and white beets was a joy to discover which each passing bite. 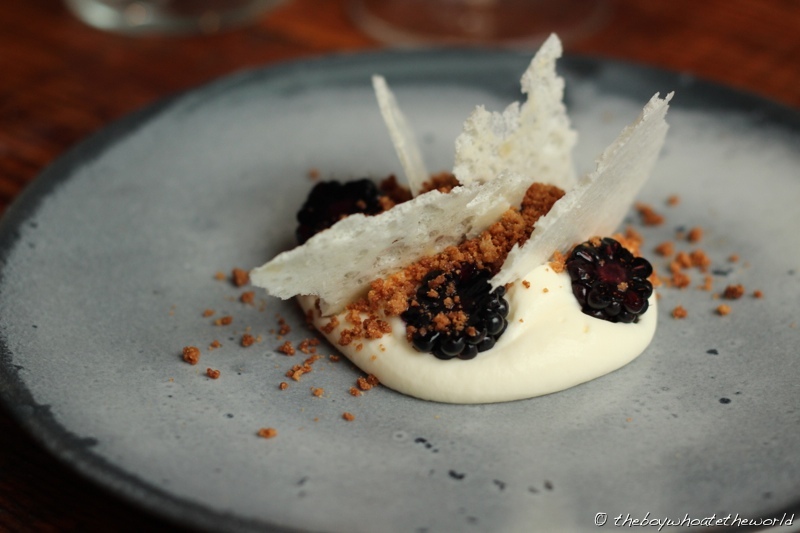 Dessert, as with the earlier courses, was yet another work of art: a rich, creamy sheep’s milk mousse covered in fresh blackberries, crumble and crispy shards of meringue-like milk crisps. Crunchy, juicy and creamy all at the same time, the different layers of textures and flavours were mesmerisingly good. An amazing lunch on the whole with some of the most beautifully plated and delicious food I’ve had all year. Who said Shoreditch was all hype and no substance? As far as my usual neighbourhood staple restaurants go, it looks like I’m going to have to divide my time between Upstairs and The Clove Club from now on. Greetings from http://www.broughtup2share.com! Nice knowing you! 🙂 You have a great blog! @Chris & Christine: Was great meeting u guys last night! Will definitely be looking up ur blog next time I’m back in KL / Asia for tips!